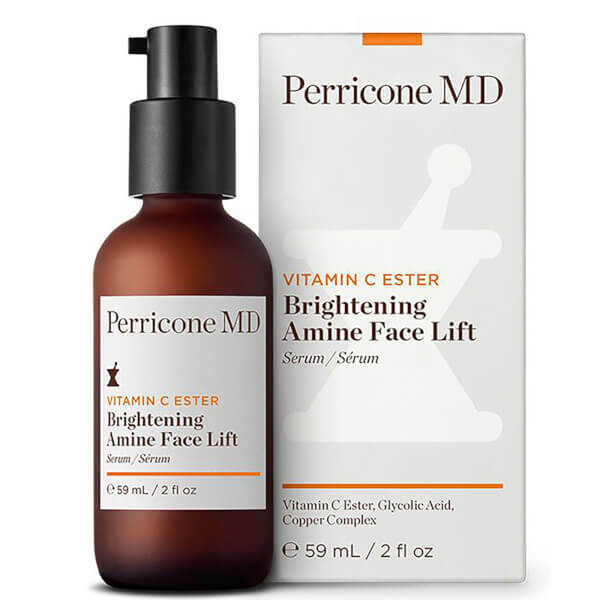 Improve your skin's overall appearance with Perricone MD Vitamin C Ester Brightening Face Lift; a creamy serum that combines gentle micro-exfoliation with firming and radiance-enhancing properties. Fortified with DMAE (the brand's signature patented ingredient) and Vitamin C Ester (a highly stable and less irritating form of Vitamin C, which is fat-soluble and easily absorbs for maximum antioxidant benefits). Promoting a luminous, youthful complexion, the lightweight treatment helps to minimise dark spots and discolouration, whilst visibly lifting sagging skin and defending against environmental aggressors. A powerful Copper Complex leaves skin with improved texture and tone. Fresh, aromatic scent. After cleansing, massage onto face and neck using a gentle upward motion. Wait until fully absorbed and follow with Perricone MD moisturizer. Use morning and evening.